This book had all my kids laughing, ages 2 through 8, though once we explained it to my toddler, he didn’t think it was very funny after all. This made us all laugh harder. Comments: It’s unusual to find a book that ALL of my kids think is hilarious. At least without using potty humor. However, this book really got deep belly laughs from all my kids. The illustrations are both adorable and hysterical. Listening to the words alone is not enough to elicit giggles. Kids really have to look at the pictures to understand the humor. My 4, 6, and 8 year olds were all laughing so hard through this read-aloud they were practically crying. 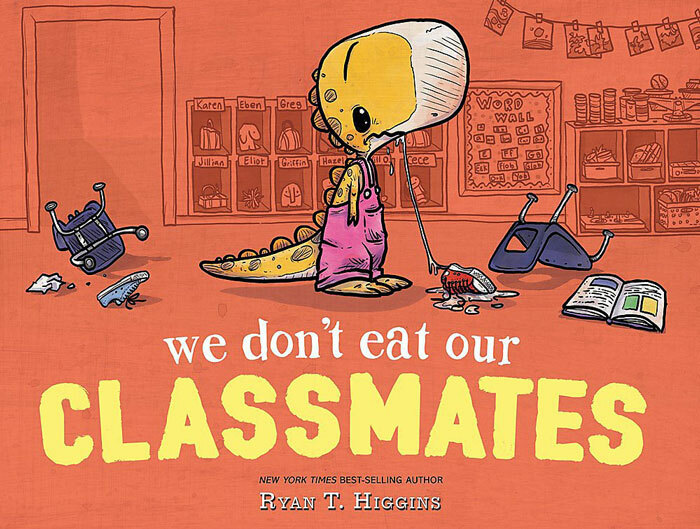 Every time an illustration would show the sweet little T-rex, Penelope, trying to eat her classmates, they would erupt. Their 2 year old brother was cautiously giggling along with them, swept up in the obvious humor of the book. However, when I tried to explain to him WHY the book was funny (because she really wanted to eat the children), he looked at us like we were crazy and stopped laughing completely. This made the rest of us laugh even harder. Maybe our family is just morbid. However, just to be clear, this book is not scary at all. Even when she eats her classmates, she spits them back out. No blood or gore. And in the end, she learns her lesson in a pretty humorous way. Though this book may still require kids to have outgrown the literal stage in order to appreciate it fully.